The shooting season ended on the last day of January, so the last of this season’s pheasants want eating. English traditional roast, pot roast, or braised is very good, but spice and game also go very well together, really enhancing gamey flavours. 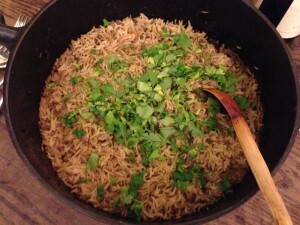 A game biryani is a ‘one pot wonder’ of a dish combining spicy meat and aromatic basmati rice. Chutney, green salad and cucumber raita would complete the meal. It takes a bit of time, but none of this is difficult. The basics of what you do are: cut the meat off a pheasant, simmer the bones for stock, make a mildly spicy stew with the boneless pheasant meat, stock and curry flavours. Once your curried bird is tender add a layer of basmati rice, and continue cooking until the rice is cooked and has absorbed most of the juices. Serve with green salad and cucumber and yoghourt raita. One pheasant will serve 3-4 people. Remove the breasts and legs from the pheasant. Cut each breast into three or four chunks, then separate the drumsticks from the thighs by cutting at the joint. Remove the thigh bone (cut lengthways with the point of a knife) and cut the thigh meat in half. Do the same with the drumsticks. Set the meat aside while you deal with the bones. 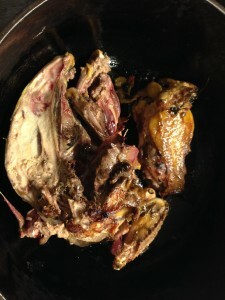 Break the carcass into two or three pieces. Heat half the butter in an oven proof pot with a lid. Fry all the bones for a couple of minutes to brown them a bit, then add the stock. Bring to the boil then cover and simmer for 45 minutes. 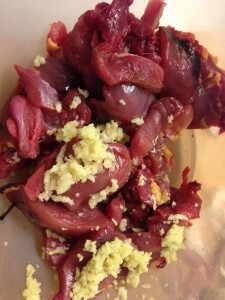 While the stock cooks, mix the pieces of pheasant meat in a bowl with the marinade ingredients. Leave to absorb the flavours while the stock is cooking. After 45 minutes, strain the stock through a sieve and wipe out the pot. Rinse the rice a couple of times with cold water, and drain in a sieve. Tip the rice into a bowl, pour one-third of the hot stock over, and leave to soak. Heat the remaining butter in the wiped oven pot, and fry the onions for about 3-4 minutes, until they are golden brown. Take out the onions, and add the spiced pheasant meat, and fry quickly on a fairly high heat, to lightly brown, for just another 3-4 minutes (you may need a spot more butter or a drop of oil). Add the remaining stock, the yoghurt, the browned onions and any marinade bits left, season with salt and pepper, stir, cover and cook at a gentle simmer for 25-30 minutes until the pheasant is tender. 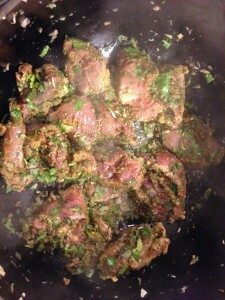 Remove the lid of the pot, and add the soaked rice, spread in a layer over the meat, then spoon over the saffron. Do not stir. Turn up the heat under the pot for a couple of minutes to bring the contents to the boil, then transfer to the hot oven for 30 minutes or until the rice is cooked. An exceptionally delicious way to use the last pheasant of the season! 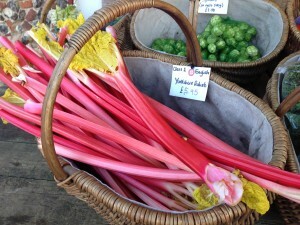 Early season, forced rhubarb is an amazing, magical crop, grown in the dark in ‘The Yorkshire Triangle’. The long pale pink stems are very delicate and need hardly any cooking, also much less sugar than the later, sturdier, outdoor variety. You should try it raw, with a saucer of sugar to dip the stalk into. More conventionally, poach for less time than you can imagine, with caster sugar, a scattering of Seville orange zest and a squeeze of the juice. Watch like a hawk to prevent ruinous overcooking. Creme fraiche, shortbread or sponge cake go well. 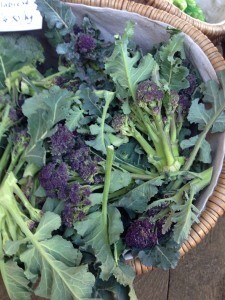 Sprouting broccoli is at its peak right now, in season from January to April. Yes, we can now get it more or less all year round, but it is now at its best, very tender and springy. There are so many ways to enjoy it, but cooked slowly with extra virgin olive oil, garlic and a chilli is one. Try with pasta, bows or fusilli, for a very simple supper.